This user was a proud participant of eL4C53. Professional Engineer with over 35 years of experience, 30 years in Oil and Natural Gas Processing with major Oil Companies abroad. Retired in 1998 as Senior Operations Engineer from ARAMCO (Arabian American Oil Company) after 25 years of service with the hi-tech Oil Giant. As a retired Engineer , I am free to choose activiities that are beneficial and satisfying to me - actvities which are consistent with my interests and expertise..
Computers have been close to my heart ever since the introduction of desktop PC and continues to be so along with the technological advances in the field. I handle almost all my requirements including finances, from home through my laptop and recently, to some extent, through the Smart Phone . I had the opportunity to gain expertise in several areas during my extensive career with ARAMCO, a high-tech Oil Giant. These include Leadership & Mentoring, Team Building, Technical Study & Presentations, Process Simulations & Modelling etc. I believe that the WikiEducator Training fits in very well with my current environment and aspirations.. I have also been sharing my knowlledge as a Cabinet Member of Lions Clubs International District 324-E-4 and as an Advisor to an upcoming Speciality Hospital at Kochi. I like acquiring and sharing information. The source is primarily the internet at present and the content could be anything from advanced technology,side effects of a medicine, to comparison of new technical gadgets, to the road test of a new car. My wife and I like movies, music, picnics and travel. We visit the movie theatre once a week or so. Sometimes, we dare to sing in small gatherings during picnics and other get-togethers. We normally use our 33- year membership of "Mahindra Holidays" for our vacation trips. I used to play Volley Ball and Basket Ball and had led the Volley Ball teams in the Colleges I studied, but not any more. Now my exercise is limited to a half-hour duration in bed prior to getting up in the morning to strenghten my back muscles and thereafter, a 15 minute walk on the Tread Mill. I registered for eL4C53, a Learning4Content workshop to learn wiki skills. 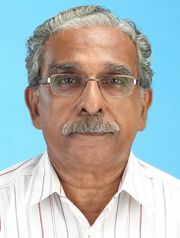 I added my name to the Wiki Educator Indian Ambassadors page per advice from the Fcilitator, Mr. Sebastian Panakal. Target Date for completion: August 31, 2012. Thank you very much sir. It is a pleasure to be part of the family. This page was last modified on 22 June 2012, at 07:59.